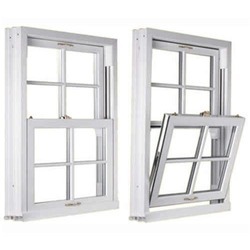 Eco-conscious consumers in the United Kingdom have a new environmentally friendly option for replacing the windows in their home. Recycled uPVC (or unplasticized PVC) is durable, energy efficient and recyclable, making it an environmentally responsible choice of material for anyone who needs new windows. Read on to learn more about the benefits that recycled uPVC windows can offer for both the buyer and the planet. Choosing uPVC windows that have been made from recycled materials helps the environment by reducing the amount of energy needed to make the windows. The carbon footprint of recycled uPVC windows is therefore lower than those made from raw materials. Recycling also helps to preserve the natural resources used to make PVC and other plastics. Traditionally, plastics such as PVC have been thought of as environmentally unfriendly because they do not break down in landfill sites. However, the recent development of methods for recycling plastics means that this characteristic of plastic-based materials is no longer the drawback it once was. Recycled uPVC windows are made from products that would otherwise have gone to landfill, including old PVC windows removed from buildings, off-cuts from the PVC window manufacturing process, and other PVC waste. As long as plastics are re-used and recycled rather than being tossed aside, their inability to degrade naturally does not pose an environmental problem. The average UK homeowner would like to help the environment, but with household budgets already stretched, price is often a bigger factor than environmental credentials when it comes to home improvement decisions. The problem is that too many green products are more expensive than their traditional polluting counterparts. Fortunately, recycled uPVC is the exception to the rule: not only is the purchase price highly affordable compared to other window options, but maintenance costs for recycled uPVC windows are also very low. Homeowners investing in recycled uPVC windows will also enjoy big savings on their home heating bills, according to experts in the industry. Recycled uPVC windows are extremely good at providing insulation, effectively keeping warm air in and cold air out, so your home can be kept at a comfortable temperature without running up enormous heating bills. As an added bonus, the double-paned glass and airtight fittings prevent the transfer of sound as well as heat, so your home will be shielded from outside noise. Once you have installed recycled uPVC windows, you can look forward to up to several decades of reliable service from them. Recycled uPVC is extremely durable; it is not affected by warp, rot, or rust. Unlike wood, uPVC does not need to be painted or varnished. If you replace your existing wood-framed windows with recycled uPVC, you can expect them to last for many years without needing to be replaced or repaired. Recycled uPVC windows are themselves recyclable. If you ever need to replace your windows, for example during a remodel of your home, you can dispose of them in an environmentally responsible way by sending them to be recycled.